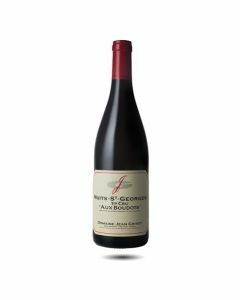 The small town gives its name to the Côtes de Nuits and its patron saint, Saint Georges, gives his name to their most famous wine. It is also home to several well-known Burgundy merchants. There are 41 Premier Crus in the appellation that stretches from Premeaux in the south to Vosne Romanée to the north. Most of the grapes grown here are Pinot Noir, but there are some plots planted with Chardonnay. The appellation is divided into two parts by the town itself. The northern part near Vosne has more purple colours, is rich and scented and has aromas of prune, plum and cherry. The more southerly climats tend to be muscular and vigorous, full-bodied with berried fruit and blackcurrant. These are sturdy wines that take some time to age; several years’ laying down rounds them out and underlines their sensuality and breeding. One of the estate's top wines grown on superb terroir on the 'Vosne' side of Nuits-Saint-Georges. It seemlessly blends the more powerful style of the Nuits and the exquisite elegance of Vosne-Romanée. Rich, energetic and brimming with finesse and class. A wine for very long ageing, requiring a good ten years to reveal the breadth of its aromatic complexity. One of the estate's top wines grown on superb terroir on the "Vosne" side of Nuits-Saint-Georges. It seemlessly blends the more powerful style of the Nuits and the exquisite elegance of Vosne-Romanée. Rich, energetic and brimming with finesse and class. A wine for very long ageing, requiring a good ten years to reveal the breadth of its aromatic complexity. A big success for this climat; delicious and welcoming with the classic pure and lovely flavours of Pinot Noir. On the palate, there is a lovely mix of violets, cassis, sweet spices and oak. Round, velvety and long with lots of potential for aging. One of our favourite climats from Grivot, this is a superb terroir on the "Vosne" side of Nuits-Saint-Georges. It seamlessly blends the more powerful style of the Nuits and the exquisite elegance of Vosne-Romanée. The 2014 is full bodied and spicy with notes of spice, red fruit, cedar and autumn berries. There is beautiful concentration on the palate with a silky texture, elegant, ripe tannins and a seductive, long finish. It would be tempting to drink this wine already but it will probably need around 6-8 years of aging to reveal its true distinction. Powerful and rich on the attack, this wine throws up surprises every time I taste it : there is lots of fruit here, round soft structure and gradually it is revealing notes of plums, minerals and spice. There is lots of freshness here, in spite of the power and above all, balance, class and a very long finish.